Out guides offer an easy way to mark where a file belongs. Simply slide it in place of the file you remove to mark the location in your file drawer. When you return the folder, the out guide identifies the correct spot to place the folder when returned. Signature, date, and file name can be written down on the guide for quick reference. 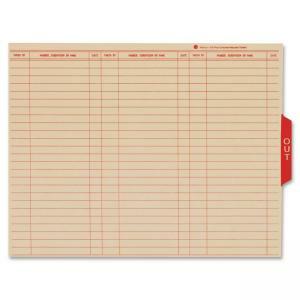 Letter-size out guides feature eye-catching red print and end tabs in the 1/5-cut center position. Out guides are made of 18 point manila stock.